Andrew Donald Booth was a distinguished pioneer in the development of computers in the UK. Andrew Booth received a PhD from the University of Birmingham during the Second World War on the crystallography of explosive materials. This work involved solving large sets of complex equations and tiring of the hours of work involved, used his natural engineering abilities, probably inherited from his marine engineer father, to build devices to do the calculations. These early efforts at automation brought him to the attention of J D Bernal who was seeking such skills for his research group at Birkbeck. So in 1945 Andrew Booth’s began his academic career in JD Bernal’s laboratory. ‘Bernal was the best boss that a young man could wish for,’ he said. ‘If you had ideas and worked hard, he gave support and let you develop in your own way.’ By late 1946 Andrew Booth was building one of the first computers in the UK. He recognized the need for a compact storage device and developed the world’s first rotating storage device in the form of a drum – now on display in the Science Museum. Later researchers adapted his technology to create the now familiar computer disk. 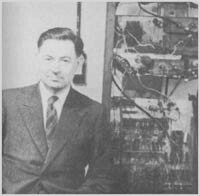 After completing a Rockefeller Fellowship at Princeton in 1947, Andrew Booth returned to Birkbeck and built the prototype Simple Electronic Computer (SEC). This was followed in 1951 by his All Purpose Electronic Computer (APEC), which was among the first generation of electronic computers. The technology behind APEC was sold for commercial development and by the late 1950s was being used in the UK’s best-selling range of computers. At the start of his fellowship in March 1947, Andrew Booth paid a courtesy visit to Warren Weaver, then Director of Natural Sciences Division at the Rockefeller Foundation. During a conversation about the Foundation funding a computer for London University Weaver suggested that funding could be provided if the computer was used to study natural language translation. This was a hugely ambitious challenge for the tiny machines in those days and Booth used the money to build his relay computer (ARC). He subsequently continued to work on natural language processing and published and edited numerous books and papers. Andrew Booth’s research on improving computer performance resulted in the ‘Booth Multiplier’ – still found inside Pentium® processors in PCs today. ‘Looking back,’ he said when he became a Fellow of Birkbeck College in 2004, ‘it’s interesting to find that the only features of the early computers that are still in use are the magnetic storage devices and the multiplication algorithm, which we pioneered at Birkbeck.’ Birkbeck’s Electronic Computation Research Laboratory, which in 1957 became the Department of Numerical Automation, was founded by Professor Booth. It is believed to be the first of its kind in the academic world, as no other university at that time had an academic department dedicated to the study and teaching of computing elsewhere it was still the role of computer laboratories. The department was also one of the first to offer a degree course in computing – the MSc in Numerical Automation. Today it forms Birkbeck’s Department of Computer Science and Information Systems. He moved to Canada in 1962, where he occupied several high-level university posts including being President of Lakehead University. In 1949 he married Dr Kathleen Britten who was then his research assistant and was one of the early female computer pioneers and wrote an important early book on computer programming.